Jobsoid lets you easily import your existing database of candidate profiles stored in Excel or exported from any other application using CSV format. You can now manage all your existing and new candidate profiles in an online cloud account while collaborating with your recruiting team. Select the CSV Tab on the Import Candidates page. Choose the Candidate Source from which you may have received these resumes. This will help you track the effectiveness of your hiring sources. Leave this untouched if you are not sure about the source of these candidates or would not like to track sources. Click on Select File button in the dropzone which will open the system dialog for selecting files from your hard drive. You can also drop the CSV file in the dropzone provided. This is an alternative to the Select File button. The toggle switch File Contains Headers will be ON. Toggle the switch to OFF if your CSV file doesn't contain the column headers in the first row. Now click the Upload Files button to proceed with the CSV import. You will now be presented with a screen showing all the columns in the CSV File. Jobsoid will automatically attempt to map the columns to relevant fields. However it is best for you to review all these mappings. Choose Skip column if you don't need data from a particular column. Now click the Start Import button in the action bar to finish the import. All required columns will need to be mapped before you can proceed with the import. You will be able to view the status of your import on the Candidates Import screen. If for some reason you did not proceed with the column mapping, you can start off from the same point by clicking the Import button next to the uploaded CSV file. 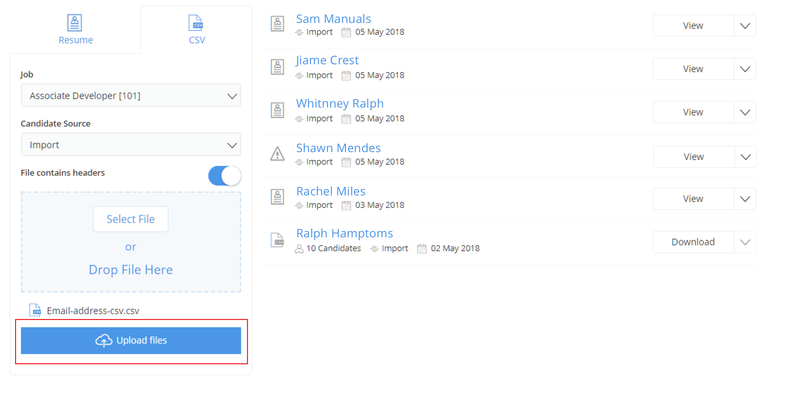 On successful import of the candidate profiles, the status will be visible to you next to the CSV file.